How Can it be Wrong to be Right? How did you get your job? Most of us who lead got to where we are by being competent, by working hard, and by working smart. Even if we acknowledge that our good fortune has been aided by some good luck, we may still feel we’re pretty darned good at – and deserving of – our jobs. Of course, we don’t say this and we probably don’t consciously think it either. Still, the question remains: if we believe we are deserving and if we are honest with ourselves, do we also believe that we are “right” in how we approach the situations we face at work? After all, we are professionals. We have trained, learned, experienced and done an awful lot to be considered the experts we are, right? Well, what if leading with the conviction that we are “right” most or all the time is actually a trap? What if that trap takes us straight to having a closed mind? What if the way to make the most of opportunities is to open ourselves to new information and different perspectives? What if our firm belief in ourselves and our competence is actually too firm? What if we are conveying – in all our “rightness” – that those around us are “wrong”? My supposition in “Leading Valiantly” is that we can go too far with being an expert. To embrace our competence is also to acknowledge its limits. When we are not conscious of these limits, we can inadvertently slip into the world I call Leadership Seductions – those pernicious “hooks” that catch us and prevent us from being as effective as we can be. 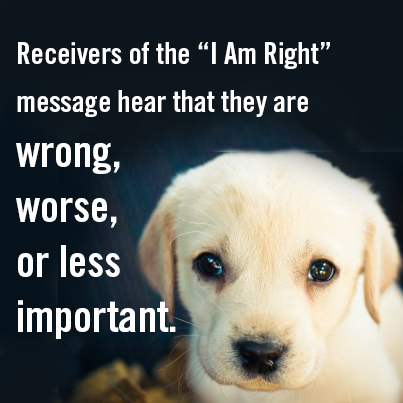 “I am right” is one of the biggest hooks of all – we can become so attached to our point of view that we can’t see anything else. 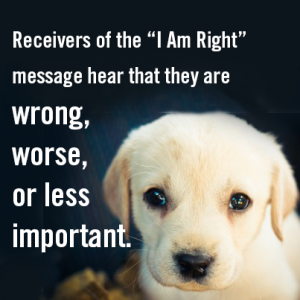 We unwittingly communicate to others that they are wrong and – you guessed it – we are right! This sets up a dynamic that creates rifts between people while rendering us far less successful – and valiant – than we could be. Staying away from a leadership seduction is not simply a matter of declaring: “I’ll never do this again.” It’s a matter of noticing when that wildly enticing hook is right there in front of you – beckoning you to proclaim your “rightness.” What is the value of being conscious of that moment? You have awareness. You can make a different choice – if you want to. This entry was posted in Blog and tagged Communication, Leader, Leaders, Leadership, Right, Seductions, Value. Bookmark the permalink. Interested In Blog Updates? Sign Up Here! or Sigma Theta Tau Intl. Watch This Space to See What's Coming Next!